Let Team Bouleris Help You Buy or Sell Your Home! My team and I have years of experience in helping our clients get the best results from their home selling and buying endeavors and we're here for you, too! Check out our blogs for information, or contact us today. Let us provide you with true Service Beyond the Sale! Are you ready for an OPEN HOUSE? 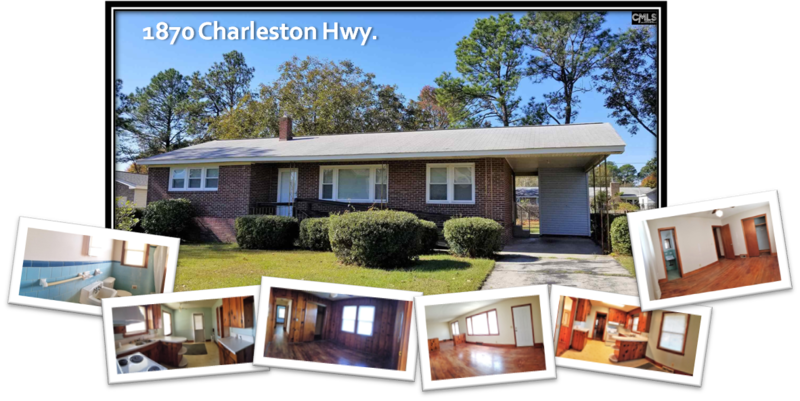 Wonderful ALL BRICK home conveniently located to I-26, I-77, airport, downtown, USC. Don't be fooled by this address...very quiet street with nice buffer to Charleston Hwy. Zoned for brand NEW CAYCE ELEMENTARY. 3 BR and 2 BA. Large kitchen with plenty of cabinet and counter space. Spacious and bright LR/DR Combo. Bright Master BR with large closet and private bath. HARDWOODS (need refinishing) throughout the house except in kitchen (vinyl) and bathrooms (tile). Upgraded VINYL WINDOWS with lifetime warranty. 1 car carport and storage room off the kitchen entrance as well as access to the large LEVELED fenced backyard. Ramp off front door could easily be removed if not needed. Sold as-is. 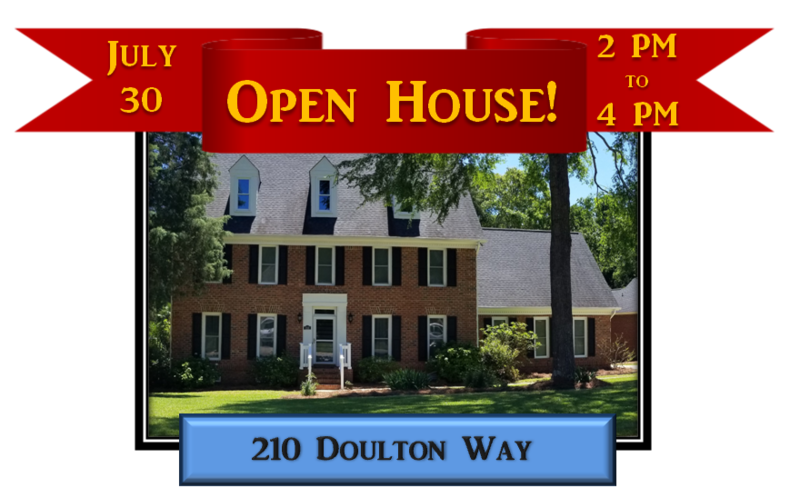 If you can't make Sunday's Open House, just call Luz Bouleris today at 803-210-9595 and schedule a private showing! A great opportunity to take a personal look at this gorgeous 4 bedroom, 3 bath ALL-BRICK home in lovely Brittany II subdivision within walking distance to Lake Murray dam. Sitting on a half acre beautifully landscaped lot and just a few short minutes from your choice of Irmo, Harbison, or Lexington. Interstates 20 and 26 lead you into downtown Columbia, so shopping, entertainment, sports events, great restaurants, and more await you! Gleaming hardwoods provide a warm welcome. Enter the French doors on your left to a great space for office or parlor. Turn right into the elegant Formal Dining Room featuring built-in corner cabinets and gorgeous molding. The bright and spacious eat-in Kitchen has lots of beautiful cabinets, granite countertops, gas stove, stainless appliances, pantry, and breakfast bar. Enjoy the wet bar leading out of the Kitchen into the large Family Room with elegant Fireplace, wainscoting, and built-in cabinet. French doors lead onto the spacious deck with attached screened Porch. Relax on this great porch overlooking the vast back yard with plenty of room for play. Head upstairs to relax in any of the 4 spacious Bedrooms, including an extra-large Master Bedroom with private Bath featuring double vanities, jetted tub, separate shower, and separate water closet. You’ll find lots of space in the deep Master Walk-in Closet. This home just goes on and on with a true Mud Room leading into a large FROG. A Laundry area, and separate stairway to unfinished THIRD FLOOR with 829 square feet for storage or a super playroom. Students living in Brittany II attend the excellent schools of Lexington/Richland Five district, including Nursery Road Elementary and Irmo Middle and High schools. You'll be so glad you took advantage of this July 30, 2017 OPEN HOUSE from 2:00 pm to 4:00 pm! If you can't wait until Sunday, just give Team Bouleris a call at 803-210-9595 and schedule a personal showing today! It’s an OPEN HOUSE and you’re INVITED! This is an open house you do NOT want to miss, because you are going to FALL IN LOVE with this GORGEOUS 4 bedroom, 3 bath ALL-BRICK home. Sitting on a half acre beautifully landscaped lot in lovely Brittany II subdivision within walking distance to Lake Murray dam. This great location puts you just a few short minutes from your choice of Irmo, Harbison, or Lexington. Interstates 20 and 26 lead you into downtown Columbia, so shopping, entertainment, sports events, great restaurants, and more await you! 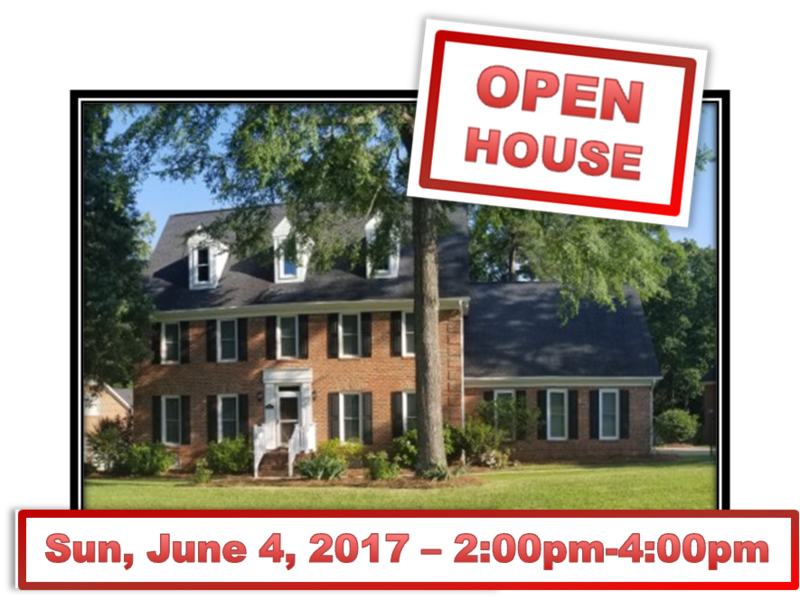 You really should see this incredible home in person and this June 3, 2017 OPEN HOUSE from 2:00 pm to 4:00 pm is a great opportunity, but if you can’t wait until Sunday, just give Team Bouleris a call at 803-210-9595 and schedule a personal showing today! This beautiful brick-front home at 233 Twin Oaks in the desirable gated community of Reflections. The home's three gabled roofs, white-railed front porch and lovely lawn with established shrubs, provide welcoming curb appeal for guests and family alike. Relax in the community pool or play tennis. Conveniently located close to Interstates 26 and 77, Fort Jackson and McEntire Air Base, you'll love being just minutes from downtown Columbia, South Carolina with great stores, dining, sports, and entertainment venues. The main level Master Suite features a sitting room and walk-in closets. Relax in the Master Bath with a large soaking tub and separate shower. Glass block windows allow natural lighting while still maintaining privacy. The main floor also features a second Bedroom with walk-ins and high ceiling. The basement level in this great home features two more Bedrooms, a full Bath, and Family Room, as well as an additional 500 square feet of unfinished space. The Great Room on the main level features a lovely gas fireplace with black floor-level hearth and elegant white wood mantle. The TV recess allows you to enjoy great movies and sports above a crackling fire. Dine in elegance in the formal Dining Room featuring glistening hardwoods, majestic column, and beautiful chandelier mounted in a high ceiling. The bright eat-in Kitchen features great white wood cabinets, granite countertops, and hardwood floors. A smooth-top stove, dishwasher, cabinet-mounted microwave, bar, and double sink add to the character and efficiency of this great Kitchen. This spacious 2,180 square foot beauty also includes a Flex Room, Laundry Closet, attached Garage, and Attic. Enjoy relaxing evenings and fun afternoons in the large back yard with patio and privacy fence. This excellent home won't be on the market long, so call Luz Bouleris today and arrange for your personal tour. Luz Bouleris is an award-winning, full time REALTOR®, and is dedicated to providing true Service Beyond the Sale. Take an up-close and personal look at this excellent home during our Open House! You'll love the quiet community with tree-lined streets and friendly neighbors. Enjoy being close to Lake Murray Dam (just a short 5-minute walk!) with gorgeous sunsets, sailing, and relax at close-by Saluda Shoals Park with lovely natural setting, hiking, and so much more. Lexington, Harbison, and downtown Columbia are minutes away with excellent restaurants, shopping, and social activities. 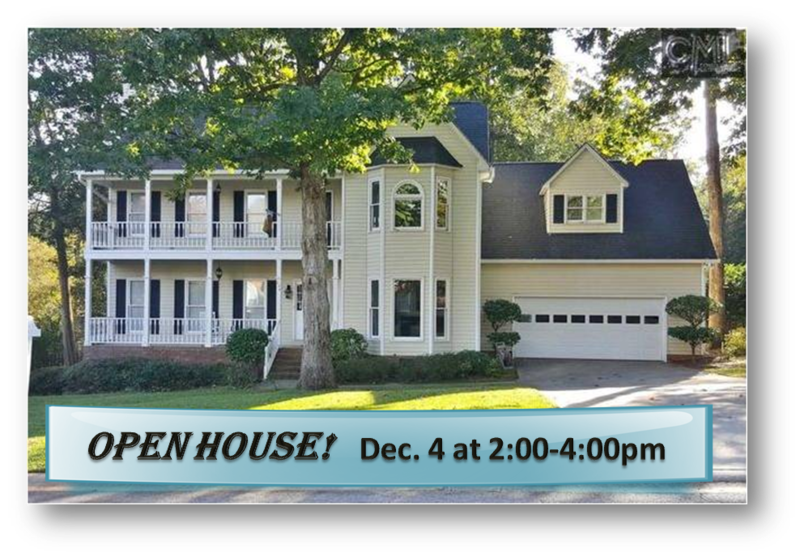 If you can't wait until December 4 to tour this gorgeous home, just call Team Bouleris today at 803-210-9595 and schedule a private showing. This gorgeous Charleston Colonial style two story, 4 Bedroom/3.5 Bath home welcomes you with TWO rocking chair Front Porches. That’s right, there’s a spacious full porch on each floor! All the better for enjoying the excellent Brittany II neighborhood, just a short 5-minute walk to Lake Murray dam and boat ramp. 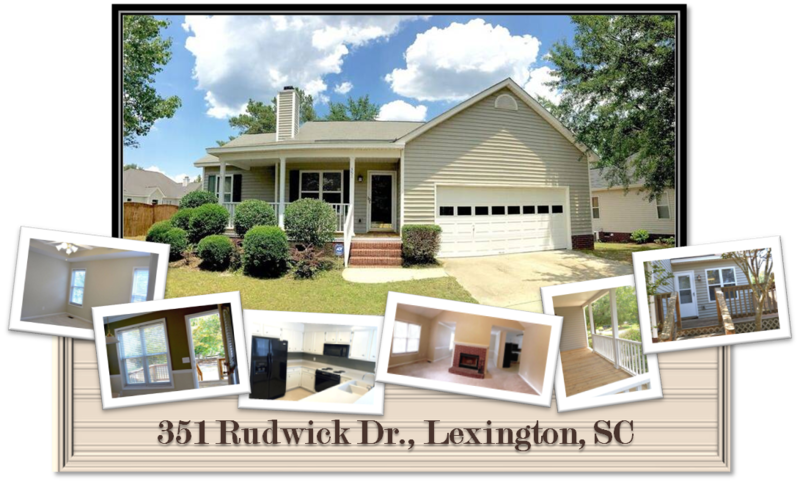 Live close to Harbison, Saluda Shoals Park, and the lovely towns of Irmo and Lexington, SC. Students attend the award-winning Lexington/Richland 5 School District, including Nursery Road elementary, Irmo middle, Cross Road intermediate, and Irmo high schools. Several higher learning institutions, such as Midlands Technical School, University of South Carolina, and more, are within minutes. Luxurious hardwoods greet you at the front door and continue in all the common areas including the spacious Living Room featuring crown molding, ceiling fan, and beautiful white mantled gas fireplace. Enjoy elegant gatherings in the Formal Dining Room with more crown molding and hardwoods. This room is perfect for a home office too, with great Bay windows providing lots of natural light. The ground floor of this home has a Bedroom and full Bath for convenience, as well as a gorgeous Eat-in Kitchen with lots of counter space with Granite Countertops, cabinets, and Island for carefree working space. Bay Windows, trac lighting, and chandelier keep this elegant Kitchen bright and cheery. Appliances include dishwasher, disposal, and above-stove microwave. 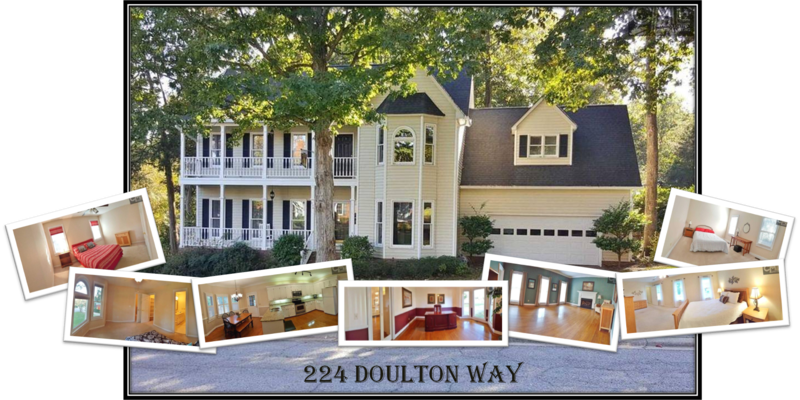 The exterior features of this home are just as gorgeous as the interior, with beautiful vinyl construction, and a great Screen Porch leading onto a relaxing deck sitting on a private lot with low-maintenance backyard. The 2-car garage is a dream with plenty of shelves to keep your life organized, a workbench, and door leading to the backyard. More features to this home include Attic storage, Smoke Detector, Laundry Room, wooden Privacy Fence along the rear of the backyard, full gutters, and sprinkler. Call Luz Bouleris today at 803-210-9595 for a private showing of this spectacular home. Are you searching for quiet country living, but don’t think you can afford it? Well search no longer! 3405 Neely Wingard Road offers just that with 1 acre of lovely mature trees, shrubbery, and peaceful sighing pines - all at an unbelievably affordable price! 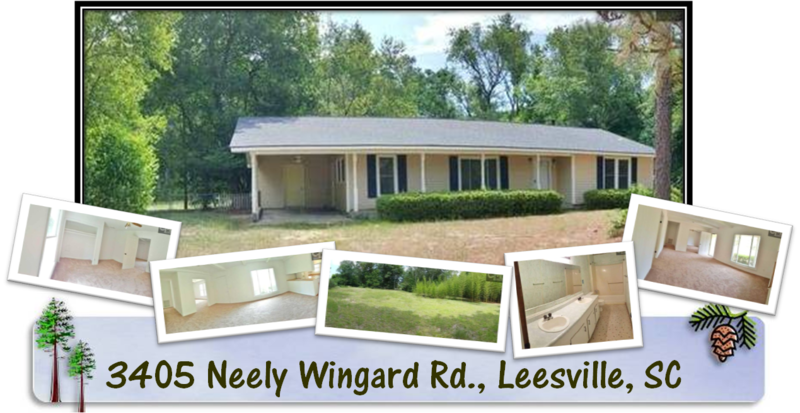 Located in lovely Leesville, SC, residents enjoy quiet living and excellent barbeque, to boot! Shealy’s BBQ is recognized throughout the Southeast reagion and it is just minutes away. Students attend the great Lexington District One schools, including Pelion elementary, middle, and high schools. This home features 3 bedrooms with 2 full baths and a separate hallway Bath for guests. The Master Bedroom includes plush carpet, a large walk-in closet, and a private Master Bath with double vanity, shower, and tile floor. A second bedroom off the Kitchen features soft carpet floor, walk-in closet , and a private bath of its own, including a shower with beautiful rustic tile. The bright Kitchen features gorgeous tile floors and lots of white wooden cabinets and counter space. White appliances match the cabinetry and keep this Kitchen bright and cheery. The lovely Living Room is right off the Kitchen and the open floor plan here allows for great conversation flow while entertaining. Another room provides space for an office or den, or can be used for a 4th Bedroom. Park your car safely in the Carport and enjoy the beautiful spacious back yard. Upgrades in this lovely home include a New Roof, New Carpet, New Paint, and New interior Doors! If you’re looking for great quiet country living, call Team Bouleris today at 803-210-9595 for a private tour of this great home. You’ll be so glad you did! 11 Gardenhill is a beautiful 4 Bedroom, 2.5 Bath home located on a quiet cul-de-sac in the desirable Summit – Summer Chase community of Columbia Northeast. A short walk along a shaded trail leads to the Community pool and Playground. Residents enjoy this quiet neighborhood close to the Village at Sandhill and more, including great restaurants, excellent shopping, galleries, book stores, and state of the art movie theaters. Easy access to Interstates 20 and 77 leads to downtown Columbia, Charlotte, and Atlanta. I-77 takes residents allows residents to avoid business traffic to I-26 and historic Charleston. Students living in the Summit attend Rice Creek elementary, Summit middle, and Ridge View high schools within the great Richland Two School District. Excellent higher learning institutions include Midlands Technical College’s Northeast Campus, South University, Southern Wesleyan, and Phoenix Universities, as well as the University of South Carolina, Columbia College, Columbia International University. 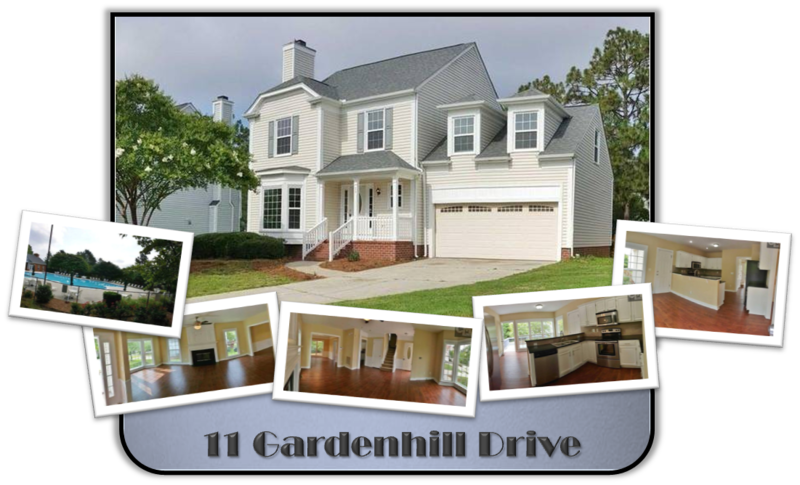 11 Gardenhill features beautiful 2-story vinyl construction with a 2-car garage, inviting front porch, and relaxing back deck. The large Eat-in Kitchen boasts granite countertops, a bar, plenty of cabinet and counter space, bay window, pantry, and new stainless steel appliances. Invite guests and family to enjoy the Open Floor Plan featuring Formal Dining and Livingroom with Gorgeous laminate flooring, crown molding, and elegant fireplace with mantel. Bedrooms are located on the second floor, including the spacious Master Bedroom with vaulted ceilings, ceiling fan, and large enclosed walk-in closet. French Doors lead from the Master Bedroom to the luxurious private Master Bath featuring a Garden Tub, separate Shower, and Double Vanity, Two more bedrooms offer comfort with carpet flooring, high ceilings and cooling ceiling fans. More features to love about this great home include a Large Deck overlooking on a Fully Fenced Flat Backyard, Central Heating/Air, and lots of windows offering warm, bright spaces. A spacious FROG with closet provides a 4th Bedroom. This home has so much to love, we don’t expect it to be on the market for long, so call Team Bouleris today to schedule your private tour. You're going to love the beautiful front yard, rocking chair front porch, and lovely living spaces in this great 3 Bedroom, 2 Bath home in lovely Sommerset subdivision in Lexington. The fantastic location provides easy access to Highway 20 and 26, Columbia Metropolitan Airport, State Farmer’s Market. Residents also enjoy the close proximity to the Riverbanks Zoo & Botanical Gardens, Lake Murray, and more. Students residing here attend Pineview elementary, Northside middle, and Brookland-Cayce high schools in Lexington Two School District. Entertain guests in the formal Dining Room with gorgeous vaulted ceilings followed by conversation or games in the gorgeous Living Room with vaulted ceilings, elegant molding, and inviting fireplace. For more casual get-togethers, enjoy intimate meals in the spacious Eat-in Kitchen. Guests and family can join the home chef at the breakfast bar. This bright Kitchen also features solid surface countertops with a deep built-in sink and plenty of counter space and white wooden cabinets. Great appliances include Dishwasher, Disposal, and over-the-stove Microwave. The regal Master Bedroom features trey ceiling with elegant crown molding and walk-in closet. Relax after a long day in the spacious Master Bath’s deep garden tub. Also featured is a separate shower and double vanity. This home includes another full Bath and two additional Bedrooms with quiet carpet, neutral colors, and large closets. The bedroom Hallway hosts a Washer/Dryer Closet and an additional extra-large closet for more storage. There’s so much to enjoy at this great home, including a large back Deck and spacious fully fenced backyard, perfect for entertaining, and you’ll have plenty of room for parking or extra storage in the large 2-Car Garage. If 351 Rudwick sounds like the perfect home for you, call Team Bouleris today to schedule your personal tour. You’ll be glad you did!